The S stands for Salvatore Casella who was an Italian immigrant. His snapshot biography was included in his March 1, 1937 obituary printed in The (Hackensack, N.J.) Record. Mr. Casella, who migrated to this country before 1900 and has lived in Hackensack since 1917, is well known in the First Ward. For a number of years he manufactured carbonated beverages, forming the company known as S. Casella and Sons. Since 1933 he has operated the Fair Grill at 81 Fair Street, Hackensack. While the facts presented in the obituary are generally in agreement with records from other sources, the time periods are slightly off. Census records indicate that Casella was born in Italy in 1878 and actually immigrated to the United States in 1904, not prior to 1900. As late as 1920 he was living in New York City. Census records show his residence in 1910 on Amsterdam Avenue in Manhattan and by 1920 he was living on Nineteenth Avenue in Brooklyn. During this time he listed his occupation as a retail dealer in coal and ice. He was first listed in Hackensack, New Jersey in the 1921-1922 directory. At that time, he was partnered with Mariano Torrisi in a bottling business located at 84 Huyler Street called Torrisi & Casella. 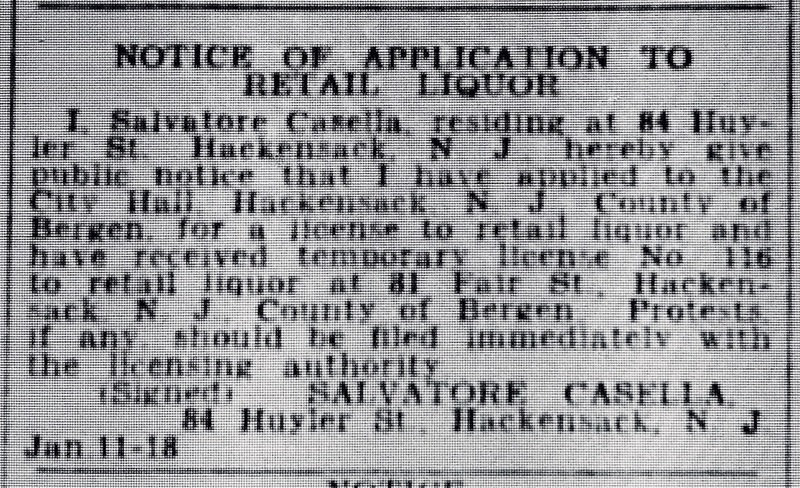 The partnership with Torrisi was apparently short-lived and by 1923 Casella was listed individually as a bottler at the Huyler Street address. By 1925, his sons Russel and Charles had formally joined the business and the company name in the directories was changed to S. Casella & Sons. The business continued to list their address as 84 Huyler Street up through 1931 (the last directory I have access to). Casella also lived at 84 Huyler so it appears that the business was always a small family run operation. Located within the same block as Casella’s bottling business was the Fair Grill. 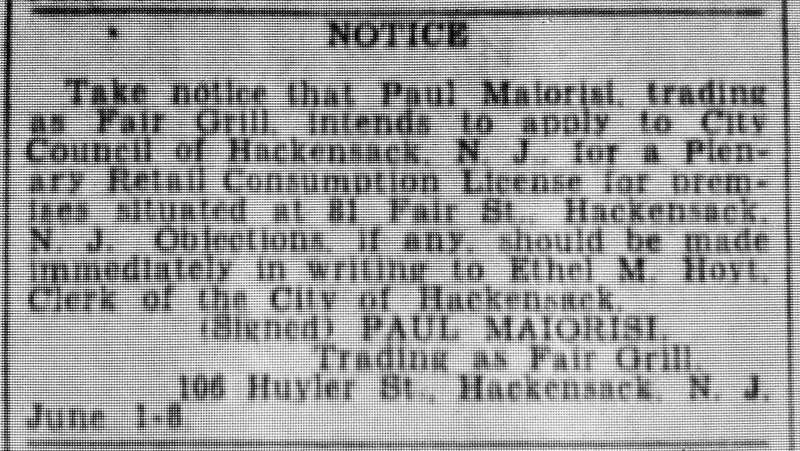 The Grill’s 81 Fair Street address was in close proximity to 84 Huyler, possibly with adjacent back yards, and it’s apparent that Casella had a connection with the Grill well before the 1933 time frame mentioned in his obituary. This is evidenced by an item that appeared under the heading “Other Arrests” in the May 15, 1929 edition of The Record. Salvatore Casella of 84 Huyler Street, arrested by Detective-Sergeant Shuart at 81 Fair Street on a charge of violating the Federal Prohibition Act. 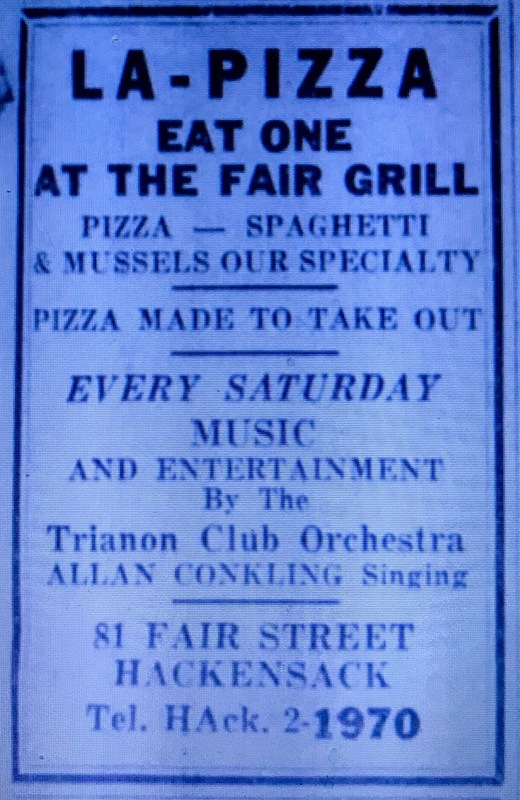 The Fair Grill under Casella’s management was referred to as everything from a take-out pizza place to an Italian restaurant to a night club in this 1935 advertisement. Based on annual license renewals, Casella owned the Fair Grill up until his death in March of 1937. 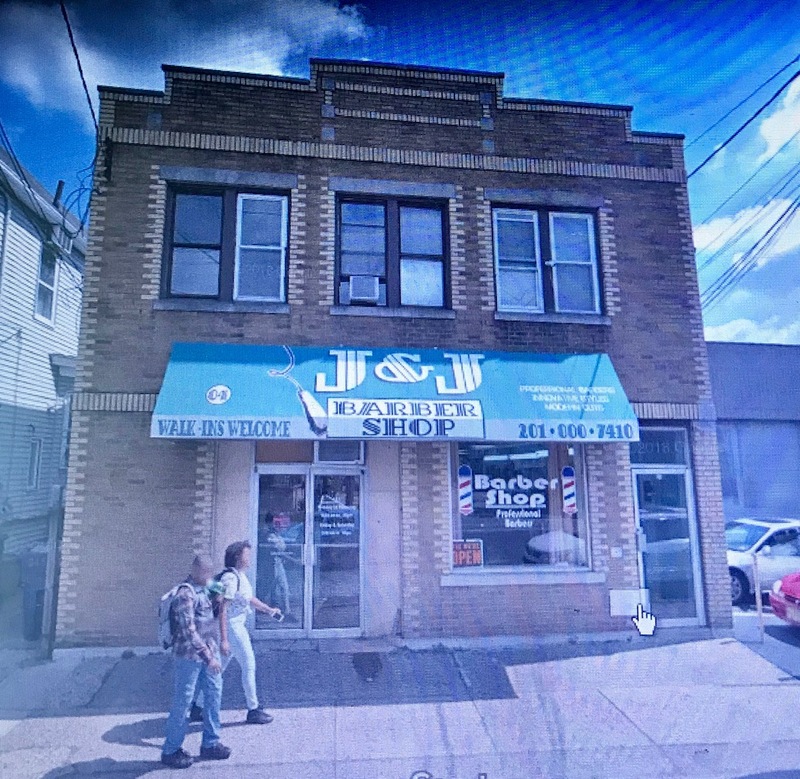 Subsequently, in June of that year, his son Russel renewed the license but by 1939 the business was apparently no longer in the family and being run by Paul Maiorisi, who applied for the license renewal in June of 1939. In the 1950’s a portion of Huyler Street was renamed South State Street. Today, 84 South State Street is a two story building, with commercial at street level and apartments above, that’s located within the block that also includes the 80’s addresses of Fair Street. It’s almost certainly the building where Casella lived and ran his bottling business. The bottle I found is 27 oz. and machine-made. It’s embossed “S. 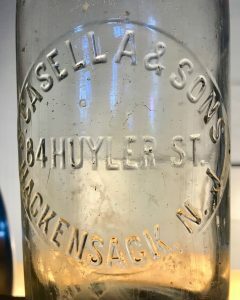 Casella & Sons” so it likely dates no earlier than 1925 when the company name changed to include “& Sons.” Neither Russel or Charles Casella reference the bottling business in the 1940 census records so I think it’s safe to say that the business had ended by then. More than likely it ended around the time that Casella began to legally run the Fair Grill in the mid 1930’s. Kirsch & Herfel was established by Hyman Kirsch and Henry Herfel in the first decade of the 1900’s. The company existed as Kirsch and Herfel up until 1920 after which both went their separate ways. Hyman Kirsch learned how to formulate soft drinks before the turn of the century when he worked for a Russian family in the Crimea. After five years in the Russian army, he immigrated to England then the United States. His obituary in the May 13, 1976 edition of the N. Y. Times (he lived to be 99 years old) picked up the story from there. Mr. Kirsch came to this country in 1903, and the next year he went into the soft drink business in a 14-by-30-foot store in the Williamsburg section of Brooklyn. Distribution of ginger ale and other sodas was by horse and buggy, and the daily production was 25 cases, made by hand. Census records from 1910 indicate that Herfel immigrated to the United States from France in 1882. Prior to meeting Kirsch he was sometimes listed as a grocer in the Brooklyn directories. Later Kirsch advertisements include the phrase “Since 1905,” so it appears that the two formed their partnership around that time. 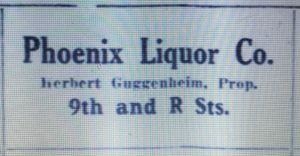 The first listing I can find for Kirsch and Herfel is in the 1907 Trow Business Directory for Brooklyn and Queens. Their address, 67 Bartlett, was in Williamsburg so it’s quite possible that it’s the location referenced in Kirsch’s obituary. A year later, the 1908 Trow Business Directory listed their address as 244 Scholes Street where they remained for the next 12 years. According to the November, 1915 issue of a publication called the “New Confectioner,” the business incorporated around that time with capital of $10,000. 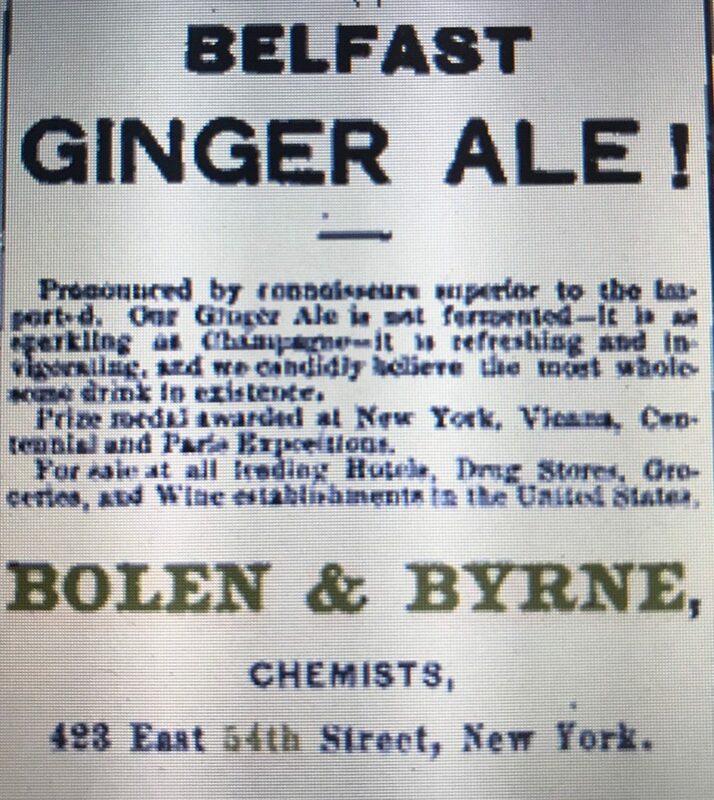 In this April 26, 1919 Brooklyn Daily Eagle advertisement the company called themselves manufacturers of soda water and another beverage called Golden Dwarf Celery Tonic. Ground has been broken for the new plant at 172-6 Cook St. of Kirsch & Herfel Co., Inc. of 244 Scholes St. The new establishment, which will be devoted to making soda water and celery tonic, will be ready to use about April 1. The building will be 225 feet long, extending from Cook St. to Flushing Ave. The latest model machinery, purchased during the convention in Chicago in November will be installed. No interim in the business due to moving will occur. The old plant will be kept in full operation until the new has completely taken over the load carried by its predecessor. Due to prohibition and other causes, the company expects a bumper season this summer and is already keeping a full force at work, although it is the winter season. In some quarters the soda water companies are expecting to step in where the breweries stepped out and take over the enormous business of quenching the nation’s mid-summer thirst. Although Kirsch & Herfel do not go so far as to predict that soda water will build up great castles of industry, such as the modern brewery had grown to be, they are very sanguine of the outlook for the coming year. Despite the optimistic outlook, five months after this story was published, an item in the June 22, 1920 edition of the New York Times announced that the Kirsch & Herfel corporation had been dissolved. Whether the dissolution had been planned all along or was the result of a recent development is not clear, but by August, the business had moved into the new plant and was continuing as H. Kirsch & Co. The August 28, 1920 edition of the Brooklyn Daily Eagle covered the story. Kirsch & Herfel Now H. Kirsch & Co. 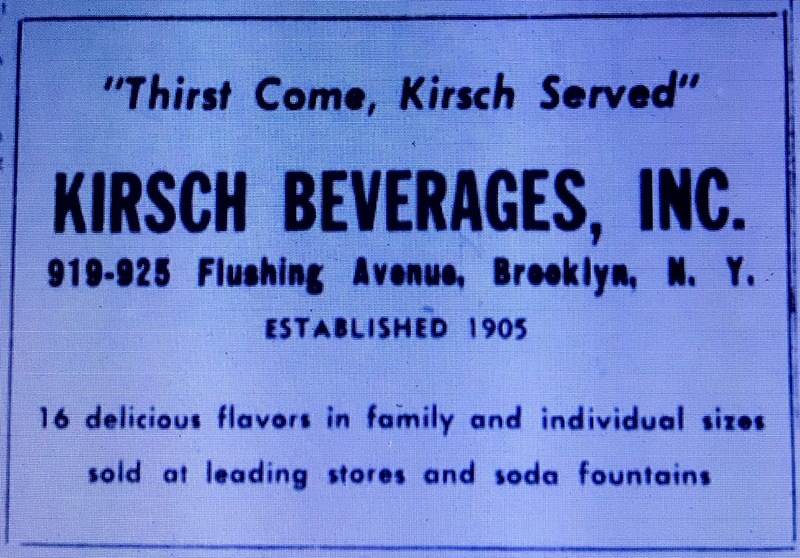 The old soda water firm of Kirsch & Herfel is now continuing the business under the name of H. Kirsch & Co., located at 923 Flushing Ave. and 172 Cook St. It was this firm which made the old reliable Golden Dwarf celery tonic, popular even at the bar of that merry old John Barleycorn person. The company’s business has grown since the institution of prohibition. It is now the largest soda and mineral water bottling plant in Brooklyn and maintains a large fleet of trucks to care for its boro business and out of town trade. According to an official of the company, a great many people have been coming direct to the factory to fill their orders. The plant has been working to capacity. Advertisements for the new business began appearing in the Eagle in early September, 1920. The demand was such that according to this March 19, 1921 story in the Brooklyn Daily Eagle, by the following summer they had doubled the capacity of their new plant in an effort to expand their product line. In anticipation of a long spring and summer, H. Kirsch & Co. have doubled their capacity by extensive alterations and additions to their factory for soft drinks at 923-925 Flushing Avenue. These extensions are now complete and include a new washing machine capable of turning out several thousand clean and sterilized bottles per hour. This company, taking prohibition by the forelock put on the market a drink called Golden Dwarf Orangeade, which quickly caught public fancy. Although the company specializes on soda water and celery tonics, sold throughout the Greater City, its new orange drink will occupy a large part of the old plant’s capacity. The extension is devoted chiefly to bottle washing, this operation in the preparation of soft drinks for the market requiring considerable space, not for machinery so much as for stacking up clean “empties” waiting to be filled. Sometime around 1930 the company expanded further, acquiring another soda manufacturer, also located in Williamsburg, called T.F. Ness & Son. 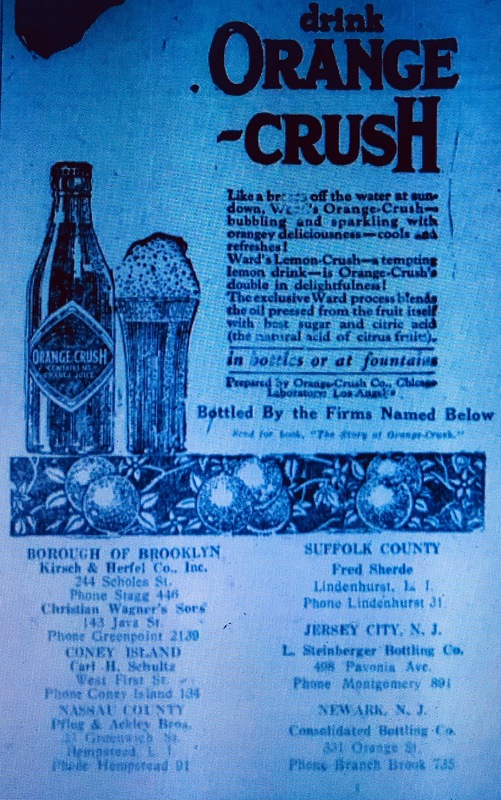 After prohibition they continued to be successful and sometime in the late 1930’s or early 1940’s they changed their name to Kirsch Beverages, Inc. By the late 1940’s they were manufacturing 16 different flavored drinks as evidenced by this 1949 Brooklyn Daily Eagle advertisement. 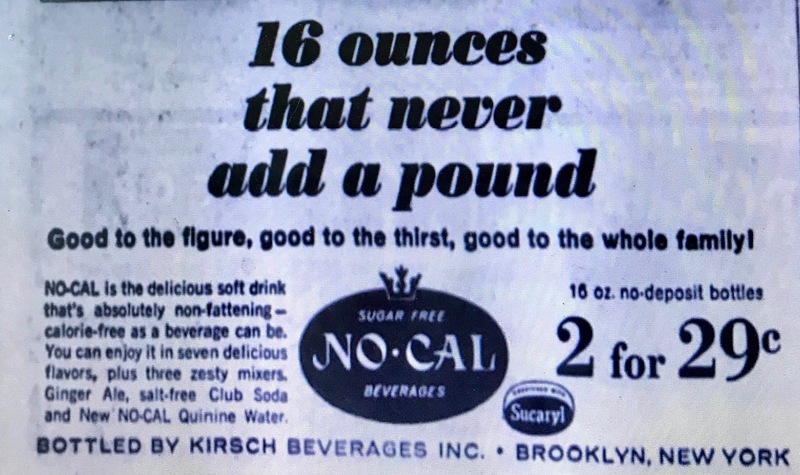 In 1952, the No-Cal Corporation was formed as an affiliate of Kirsch Beverages, Inc. to produce a new line of sugar free soft drinks. Hyman Kirsch’s 1976 New York Times obituary described how the “sugar free” concept got started. Mr. Kirsch began the commercial production of sugar free soft drinks in 1952, when he started distributing them through dietetic outlets under the No-Cal brand. The idea for the product was the byproduct of one of his many philanthropic activities. As vice president of the Jewish Sanitarium for Chronic Diseases, he and his son, Morris, had become concerned about the lack of a sugar-free, nonalcoholic beverage for diabetic patients of the sanitarium. They got together in the laboratory at Kirsch Beverages with Dr. S. S. Epstein, their research director, and explored the field of synthetic sweeteners. Saccharine and others left a metallic aftertaste. Then, from a commercial laboratory, they obtained cyclamate calcium, which proved satisfactory in soft drinks produced for diabetic and cardiovascular patients in the sanitarium. 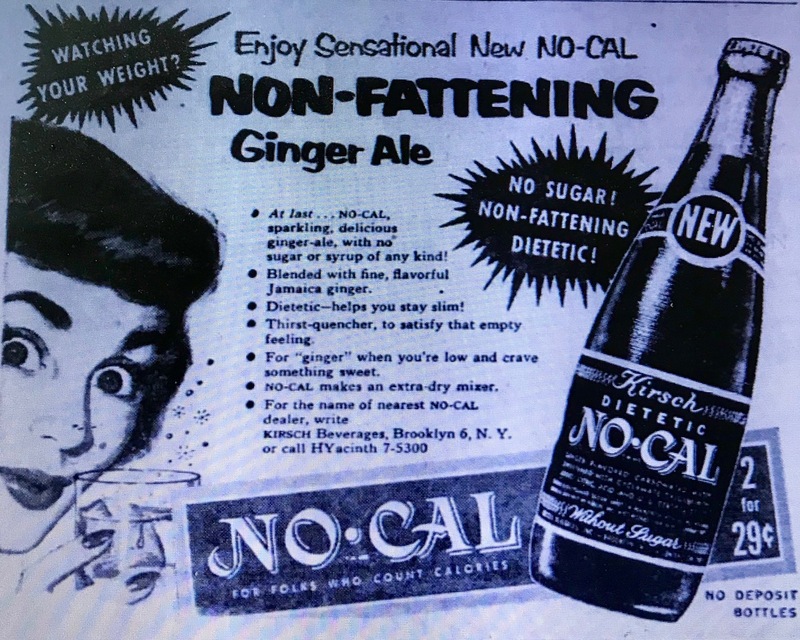 No-Cal Ginger Ale was first to hit the market in March, 1952 and by the end of the year four additional flavors were being sold. This early ginger ale advertisement appeared in several June, 1952 issues of the New York Daily News and Brooklyn Daily Eagle. 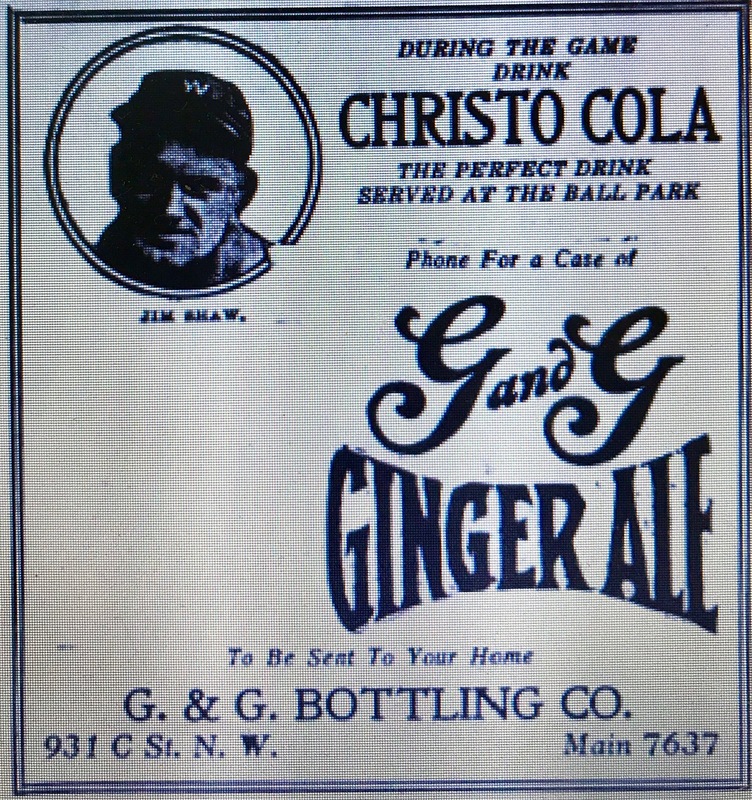 By December the advertisements included Cola, Cream Soda, Black Cherry and Root Beer as well. Originally intended for dieters and those with medical issues like diabetes, it wasn’t long before the company focused their marketing efforts on the public at large. The reasoning behind this change was explained in an April 10, 1953 story in the Long Branch (New Jersey) Daily Record. More than a year ago Kirsch Beverages, Inc. marketed their new sugar free NO-CAL ginger ale. Aimed primarily at the dietetic and diabetic markets, NO-CAL was an immediate sales sensation. 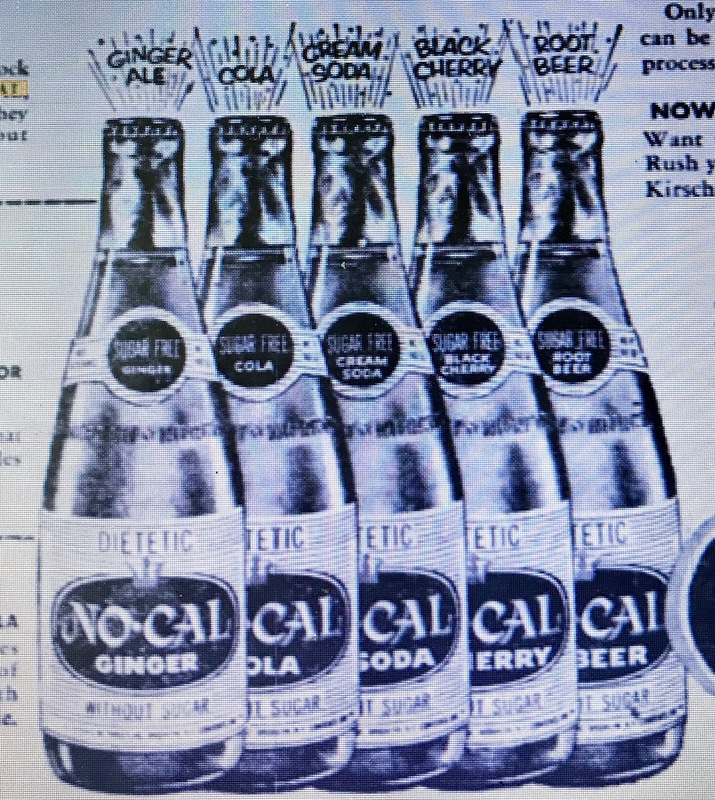 As sales doubled and re-doubled with each passing month, the pleasantly amazed Kirsch people enlarged their bottling capacity and developed four new NO-CAL flavors, cream, cola root beer, black cherry. In an all out effort to capture this huge market, Kirsch is initiating this program with a quarter-of-a-million dollar “saturation advertising campaign. Their focus on the weight conscious market is exemplified by this 1954 advertisement that appeared in the New York newspapers. 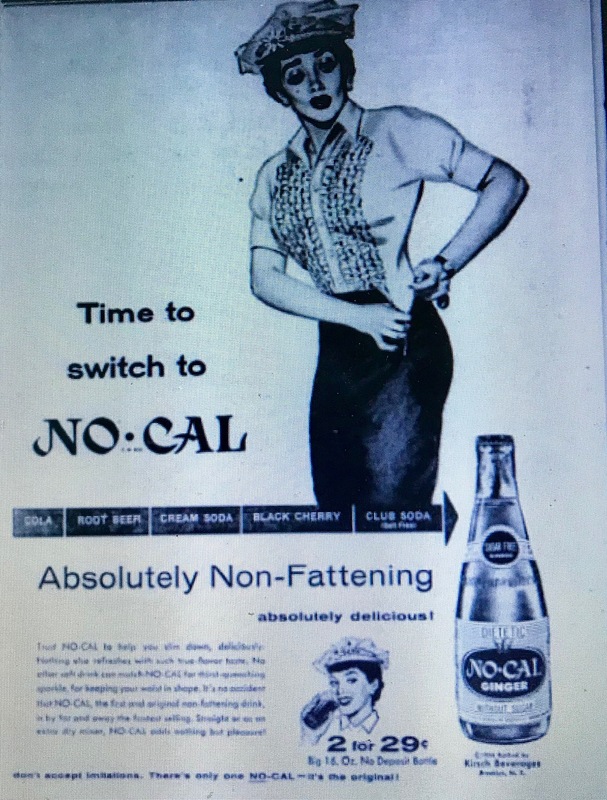 With the tag line “Time to Switch to NO-CAL,” the advertisement was designed to make you weight conscious even if you weren’t! 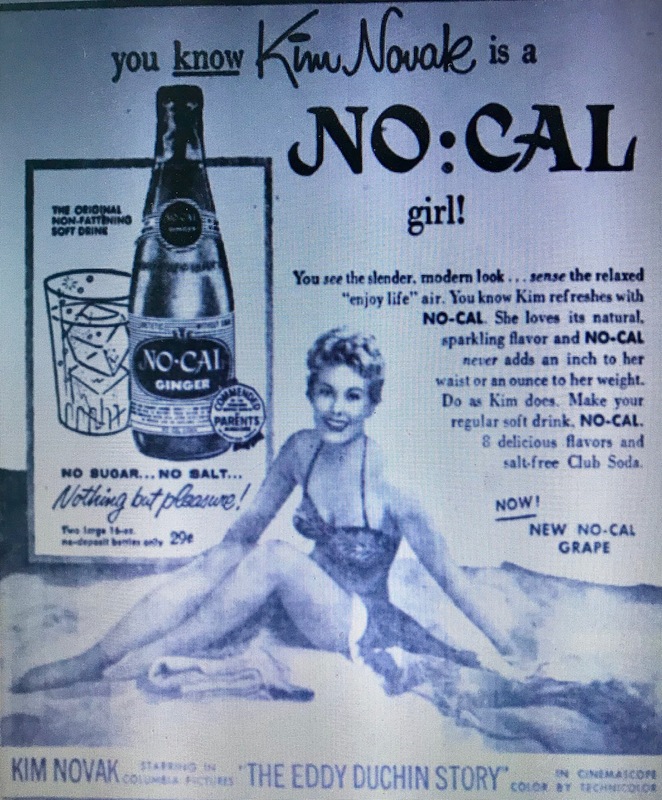 You know Kim Novak as a NO-CAL girl! You see the slender modern look…sense the relaxed “enjoy life”air. You know Kim refreshes with NO-CAL. Our first decision the morning after the ban was announced was that we wouldn’t go out of business. That gave us just eight weeks to develop a new formula and market it. This October 22, 1969 New York Times News service story found in the Franklin (Pennsylvania) News Herald demonstrated that they had been up to the task. The nation’s diet food and soft drink manufacturers rushed out new-product announcements yesterday, indicating they had been prepared for the Government’s ban on the use of the artificial sweetener cyclamate in general-purpose food products. No-Cal Corporation, a wholly owned subsidiary of Kirsch Beverages, Inc. will have a new line of No-Cal drinks on the market in about two weeks. A company spokesman said they will contain sacharrin and a small amount of sugar, adding about 10 to 14 calories to the drinks. Both Kirsch Beverages, Inc. and No-Cal Corporation remained under control of the Hirsch family until 1980. Morris Kirsch, Hyman’s son, had joined the company in 1926 and assumed the presidency of Kirsch Beverages sometime in the early 1940’s. By 1971, according to the Tampa Tribune feature on the business, Morris’s sons, David and Lee, were presidents of No-Cal Corporation and Kirsch Beverages respectively, and both Hyman, at the age of 94, and Morris were still active on the board of directors. Around this time the business moved to a new location in College Point Queens at 112-02 15th Avenue. Hyman died in 1976 at the age of 99 and his son Morris retired in 1980. At that time the Kirsch companies were acquired by a Philadelphia bottler named Harold Honickman. According to January 21, and March 19, 1980 articles in the Daily News, shortly after acquiring Kirsch, Canada Dry awarded him a bottling and distribution franchise and their products were added to his College Point production line of Kirsch and No-Cal sodas. After years of mergers, the man who would be king today is Harold Honickman, head of Pennsauken, N. J. based Honickman Enterprises. The leading independent bottler of Canada Dry products gradually acquired such city favorites as Dr. Brown, Kirsch, Hammer, Hoffman, Kirsch’s No-Cal brand and Meyers 1890. Though distribution is somewhat limited, all brands but Kirsch and Meyers are still alive. 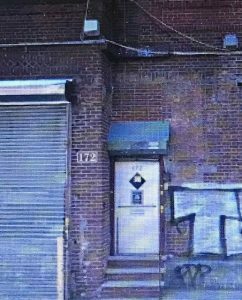 The 244 Scholes Street address no longer exists and is now within the limits of Ten Eyck playground which is under the jurisdiction of NYC Parks and Recreation.The building currently located at the 172 Cook Street address is likely the building built by Kirsch & Herfel in 1920. The College Point plant is now owned by Pepsi. So, you ask, “What became of Henry Herfel?” Well he certainly didn’t achieve the same notoriety as Hyman Kirsch. A year after their partnership was dissolved, he established another Brooklyn soda water company named Herfel & Co. The company was listed as a new corporation, with capital of $20,000, in the April 15, 1921 edition of the New York Times. The incorporation notice named Herfel, along with J. Grodinsky and E. Heyman as directors. The initial company address was 215 Montague Street. By the mid 1920’s, the directories listed the company address as 257 Ellory Street with Morris and Sam Shapiro named as proprietors. Herfel was no longer mentioned. A notice in the June 8, 1934 edition of the Brooklyn Daily Eagle announced that the corporation had dissolved. The bottle I found is machine made and 27 oz. 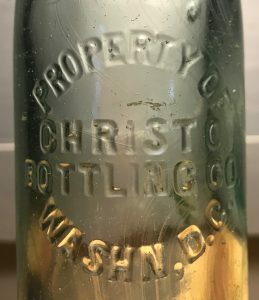 It’s embossed with the name “Kirsch & Herfel Co., Inc.,” which dates it between 1915, when the original business incorporated, and 1920, when it dissolved. 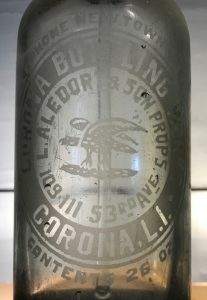 Corona Bottling Co., 109 – 111 53rd Ave., Corona, L.I., L. Aledort & Son, Props. Telphone: Newton 2399. The first listing I can find for the Corona Bottling Works is in the Brooklyn and Queens Section of the 1924 NYC Telephone Book. There’s no address listed but the phone number – Newtown 2399 matched the one on the bottle. In the October 1925 edition of the phone book they changed their phone number from the Newtown Exchange to a Havmeyer exchange. In 1927 and 1928 they listed 103-13 53rd Ave as an address. This isn’t the same location etched on the bottle but it makes sense that they moved at the same time they changed phone numbers. 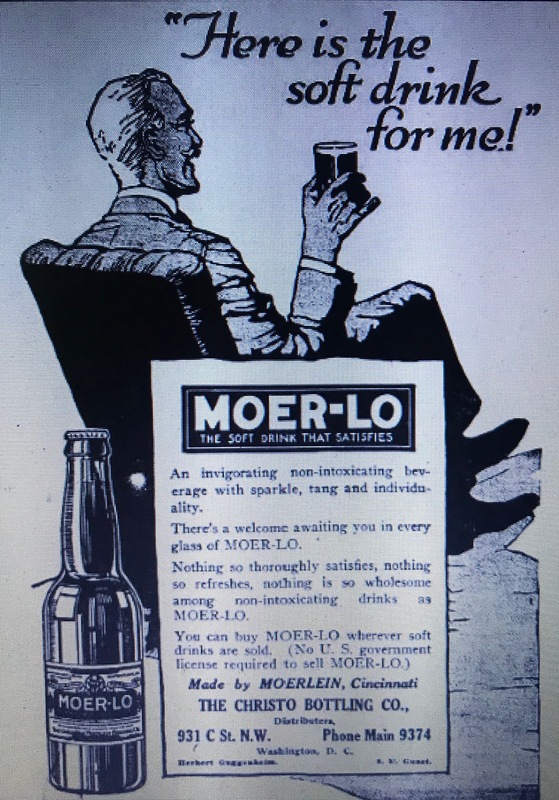 During this period, Louis Aledort and the business of L Aledort & Co. are also listed and both always share the same phone number with Corona Bottling Works so they are probably one and the same business. The listing for L Aledort & Co goes back to the 1917 edition of the phone book so it appears the business started around this time. I can’t find enough information to determine the end date of the business. The bottle I found is an etched 26 oz siphon bottle. It probably dates to the early 1920’s when they started using the Corona Bottling Works name but no earlier than 1917 when the business started. The J stands for Joseph Wittmann. 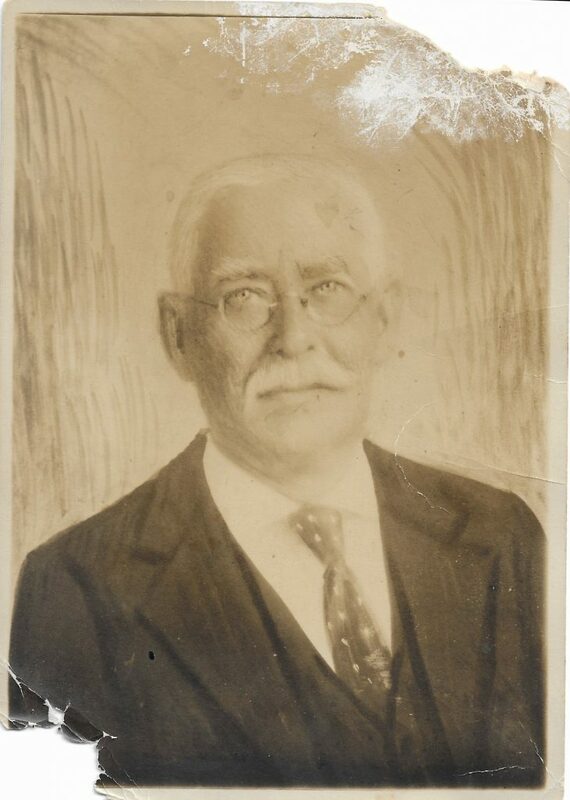 Joseph Wittmann, Queens Ward 4, appears in census records from 1900 to 1930. Over that period, he listed himself as a bottler, proprietor, manufacturer and retail merchant of mineral/soda water. According to a September 28, 1940 Brooklyn Daily Eagle article announcing his death, Wittmann was born in Brooklyn and lived in Queens for 46 years. He died in 1940 at the age of 76. The business apparently started in Brooklyn in the late 1880’s. Joseph Wittmann, bottler, was listed in the Brooklyn directories between 1889 and 1891 with an address of 729 Flushing Avenue. He was not listed in the 1887 Directory. Sometime between 1892 and 1898, the business moved to Thrall Pl, corner of Broadway, Woodhaven, where it’s listed in the 1899, 1903,1907, 1908-1909 and 1912 Trow Business Directories of the Borough of Queens under mineral water. It was also listed in the Brooklyn, Queens and Staten Island Section of the New York Telephone Directory as Carbonated Beverages through at least 1928. By this time, the address was 97-40 91st but I don’t think the location changed because Thrall Place was renamed 91st Street. Based on the census records the business could have lasted into the 1930’s. I’ve also observed machine made (28oz) bottles in the bays as well. VER-VAC was the first cola concentrate made by the H R Nicholson Co. of Baltimore Maryland. They first appear in the Baltimore directories in 1917, listed as the Ver-Vac Company, Roy T McFadden and Geo Murphy props, soda water, 111 s Gay. It looks like the H.R. Nicholson Co. got involved soon after. In the 1918 directory Frank A. Hyde, the secretary-treasurer of Nicholson is listed with The Ver-Vac Co., and McFadden and Murphy are not. The following information on VER-VAC came from “The House of Quality: The History of the H R Nicholson Co.” by Harry R. Nicholson as summarized by the web site Five Star Soda.com. It confirms the H.R. Nicholson Co.’s involvement. Nicholson developed and invested in VER-VAC, a cola designed to compete with Coca Cola. It’s growth was hindered by increased sugar prices and sugar rationing associated with World War I. The amount of sugar businesses were allotted was based on their usage prior to rationing and since Ver-Vac was a relatively new venture, Nicholson didn’t get enough to run the business. As a result, the company went flat around this time. the VER-VAC Company of 11 South Gay Street, Baltimore has been incorporated with $50,000 capital to manufacture flavoring extracts by Harry R Nicholson, Carl Murbach and W Howard Hamilton. Several months later, in April of 1920, the VER-VAC Company advertised a public offering for 40,000 shares of stock. The documents associated with that offering provided an overview of the business at that time. VER-VAC is a non-alcoholic beverage, distinctive, refreshing, pleasant in taste and non-injurious. It is the result of years of effort and is today recognized by numerous bottlers and others familiar with its quality as being the most palatable cola drink on the market and since it has been offered the public, has met with instant success and popular approval. The VER-VAC Company does not bottle its own product and not unlike other soft drink manufacturers, distributes its syrup in concentrated form to bottlers throughout the country, who in turn distribute the bottled beverage. It is also sold in concentrated forms to druggists or wherever soft drinks are sold over the counter. VER-VAC is distributed by bottlers only under the name of VER-VAC and it is the intention of the VER-VAC Company that all bottling concerns having the exclusive distribution, will be known as the VER-VAC BOTTLING COMPANY of their respective localities. The Company’s plant is located at 111 South Gay St., Baltimore, Md., and occupies the entire warehouse with floor space of over 12,000 square feet. The plant is fully equipped with new and modern machinery for the manufacture of VER-VAC Syrup. The entire equipment is glass-lined throughout, of the most sanitary type, the system installed enabling the company to start its raw materials on the top floor of the building and gravitate through the various stages of manufacture to the first floor of the plant where it is ready for shipment, thereby reducing the cost of manufacturing to a minimum expense. The present capacity of the plant is 750,000 gallons of finished VER-VAC Syrup annually and the demand for this beverage is far in excess of this capacity owing to the increasing demand for a good soft drink, particularly since prohibition has become effective. The July 1920 issue of the Beverage Journal stated under “Maryland Notes” that “the Ver-Vac Bottling Co is now in operation, operating nine trucks in distributing Ver-Vac to the retail trade. An advertisement in the May 15, 1921 issue of the Newport News, Va. Daily Press identified that area’s local bottler as Epstein Brothers. 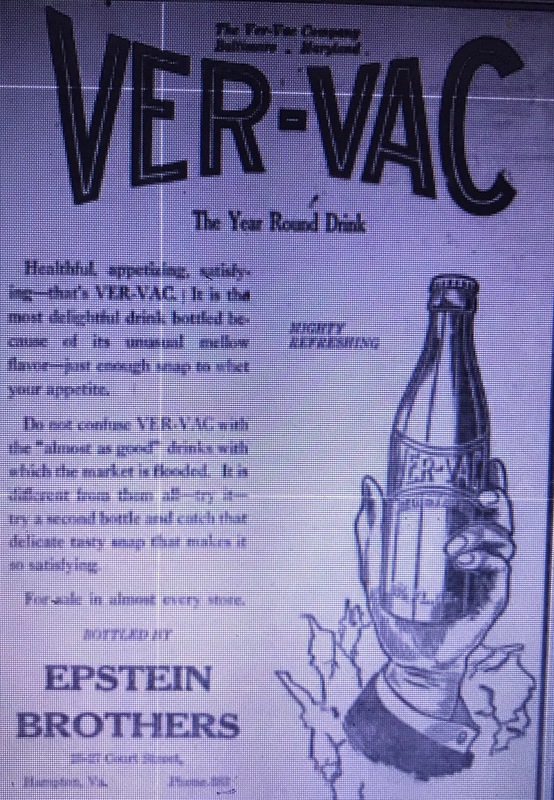 VER-VAC appears in the Baltimore directories through 1931 as the VER-VAC Products Co., listed as either syrups or extracts. They were always located at 111 s Gay. By the mid 1930’s they are no longer listed. The one VER-VAC bottle I found is machine made and similar to the one in the Virginia advertisement. Near the base, it’s embossed “Ver-Vac Bottling Co. of New York.” I haven’t been able to find a listing for them or identify which company that was. 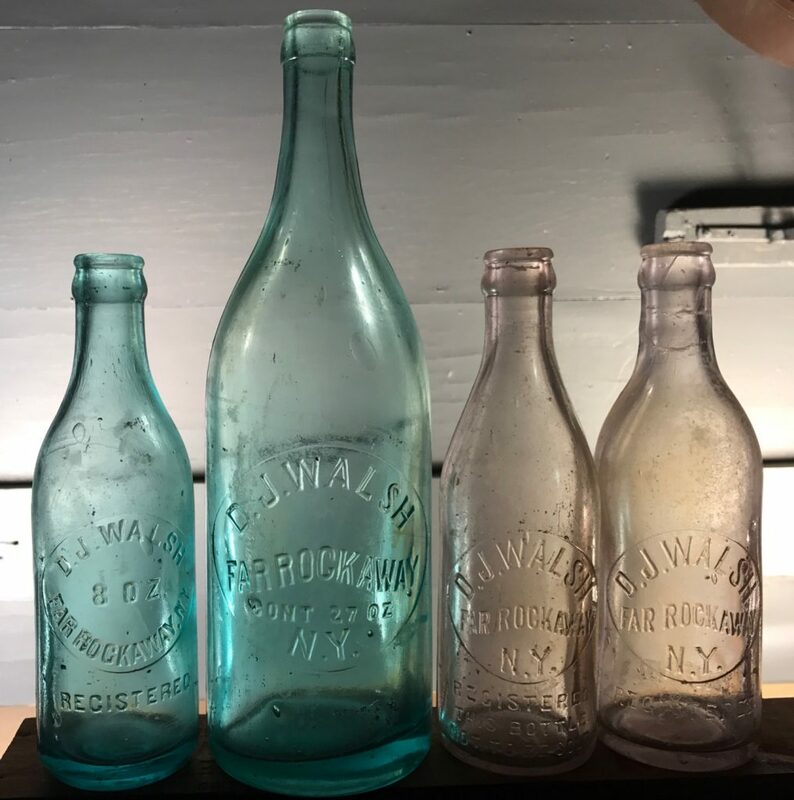 Daniel Joseph Walsh was a long time Far Rockaway bottler in the early 1900’s. His great-granddaughter, after reading the initial version of this post, contacted me and was kind enough to provide this picture of him. An Irish immigrant, he listed himself as a bottler and/or mineral water manufacturer and proprietor of his own shop in the 1910,1920 and 1930 census. A couple of his young sons were also listed as bottlers or bottler helpers, leading me to believe it was a small family run operation. This was confirmed by his great-granddaughter who said that her father, D J Walsh’s grandson, pitched in to help as well. 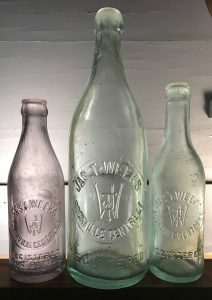 Growing up, my father talked about his grandfather’s soda co., and how he would go and visit after school (elementary) and help fill the bottles. In the 1900 census records I can’t make out his occupation but it does not appear related to bottling or mineral water. This would put him in the bottling business for 20 + years from pre-1910 to the early 1930’s. I did find him listed on Cornaga Avenue in several Queens County telephone directories between 1925 and 1928. A Walsh “for sale” classified ad in a 1922 issue of the “Re-ly on Bottler” also listed their address as Cornaga Avenue in Far Rockaway. They were selling a Hammond bottle washer (60 boxes per hour) and a liquid carbonic generator. 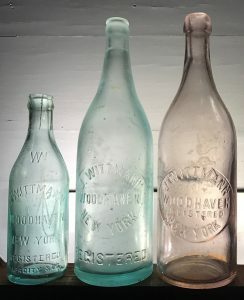 Walsh was reportedly one of the first to make charged siphon club soda bottles according to local historian Emil Lucev, a contributer to “The Wave” a local Far Rockaway newspaper. I found one large (27oz) tooled crown and several smaller (8oz) tooled crowns. Several machine made bottles (8oz) have also been observed. No blob top bottles have been found to date but I’ve seen photos on the Internet (both 8oz and 27oz). I’ve also seen D J Walsh siphon bottles pictured on the Internet.